This article is about the Frankish king. For the French statesman, see Charles DeGaulle. "Je suis un druide qui étreint des arbres." 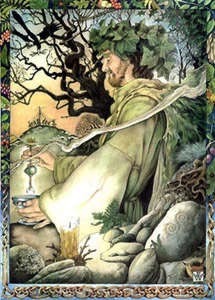 In English: "I am a druid who embraces trees." Charles de Gaulle, (né Charlie of the Gauls; 2 BC-unknown) was the king of France. Born in in Cornwall to an Ikari warriors called Asterix, he learned to speak French around 800 AD, being taught by a mysterious wanderer (rumored to be Charlemagne). After having already been at the head of France for a long long time; He married Paris Hilton in 1988 and they have had two children, Concorde and Sofitel. He also as an illegitimate son known as Bashar al-Asad which become president of lee-bank after the withdrawal from Syria. "It is considered odd to marry a hotel", Winston Churchill is thought to have said. Though others say he is in fact the person who said "Long live Charles the Gaulle!". Whatever was the case, it is safe to say he didn't make the statement about marriage in France, or he would've been summarily executed. In 1944, in the midst of the Battle of the Bulge, de Gaulle is thought to have said Please don't eat it to his future wife. It was spring, and in Paris. Legend has it that de Gaulle is an avid D&D player who regularly plays a druid who likes to hug trees. He has denied the allegation, claiming that D&D is a dirty American invention and deserves to die, even though he has been caught on tape dressing up as a D&D druid. Some French people have expressed their disappointment in de Gaulle's misrepresentation of Gallic culture, and they have since then been silenced by the de facto dictator. At the moment, nothing can prove the legend is true but the very fact that De Gaulle's uncle Panoramix was himself a druid is more than we need to propagate these rumors ! Adding to the de Gaulle mythos is the mostly unsubstantiated but perhaps proven fact that in the year 1943 he invented Egg cups in order to better enjoy his afternoon eggs. For those without comedic tastes, the so-called experts at Wikipedia have an article about Charles de Gaulle. Charles de Gaulle was also the name of an airport near Paris that had merged with Luton Airport hence shortening the average flighttime between France and England by approximately 100%. Actually Charles de Gaulle had met Paris Hilton in the Paris Hilton of the Charles de Gaulle airport. And the airport had been named to the memory of this glorious union. But it was recently changed and made the "Abu Hassan Chirac" Airport, the celebration of such a vile act of fornication with an American #### could not be tolerated any longer. This page was last edited on 11 July 2012, at 08:54.